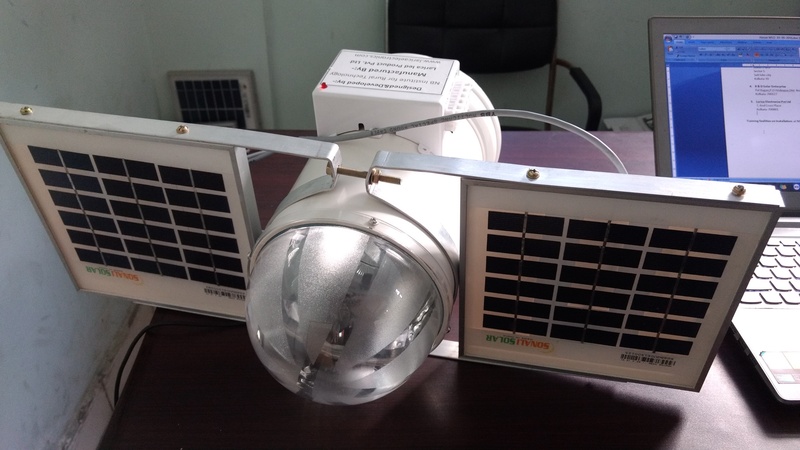 The Surya Jyoti Micro Solar Dome is a unique device designed to tackle the problem of access to lighting for remote and underdeveloped communities. There are currently millions of off-grid households in rural areas or households in urban areas without reliable electricity. The device is low cost, simple to use and eco-friendly. It can work for up to 17 hours giving an illumination equivalent of a 60 watt incandescent lamp, with a lifespan of up to 20 years for the dome structure. The device has a transparent semi-spherical upper dome made of acrylic material which captures the sunlight. The light passes through a sun-tube, which has a thin layer of highly reflective coating on the inner wall of the passage. The latest model operates in three modes: daylight without any electricity, night time with solar PV and night time with conventional grid after 17 hours of operation. 4,000 Micro Solar Domes have been installed in impoverished parts of Delhi, Mumbai, Kolkata and Bengaluru. They have been tested and developed with support from the Department of Science and Technology’s Clean Energy Research Initiative. 54 technicians from 14 states have been trained in the manufacturing process. The installation of Micro Solar Domes could lead to an emission reduction of 12.5 million tonnes of CO2. The Department of Science and Technology is providing training and licenses to start-up and self-help groups to make the lamps. Attempts are also being made to integrate the device for subsidy in rural and urban housing schemes, MP Local Area Development Schemes, and Corporate Social Responsibility activities of public sector enterprises.